Escribo frases que riman, a veces. Lectora compulsiva. Solo quiero atormentar, no es nada personal. 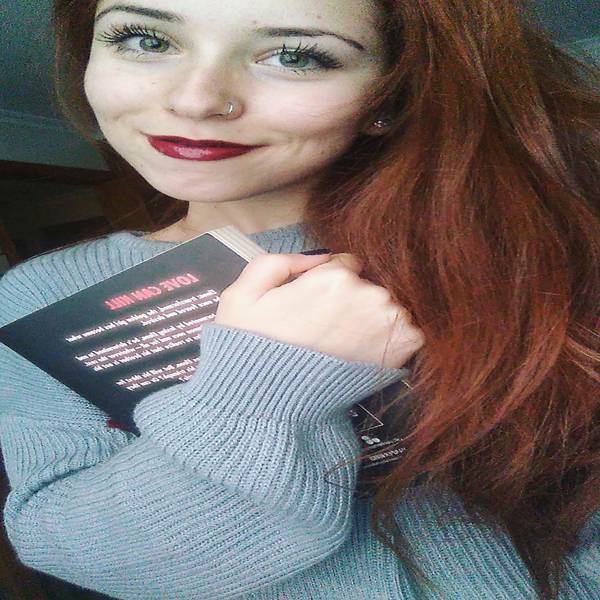 También publico "VERSOS DESVELADOS" en WATTPAD. ¡¡Seguidme en Instagram; LauraAshHeart Spain. Mis queridas flores de Narciso, acabo de subir el capítulo 11 de mi novela MACABRA POESÍA, espero que os encante tanto como a mi me gustó escribirla y espero los comentarios con vuestras opiniones! si os encanta me hará muy feliz y si me podéis ayudar a mejorar MEJOR QUE MEJOR! UN HÉROE MALDITO, UN ALMA SUICIDA. AMBOS ENZARZADOS EN EL TRÁGICO ROMANCE, FRUTO DE SU MACABRA POESÍA. CAPITULO 9 DISPONIBLE, QUERIDOS NARCISOS ! DOS CAPITULOS NUEVOS, NACIRSOS! ESPERO QUE OS GUSTE, NO OLVIDEIS DEJAR UNA RESEÑA CON VUESTRA OPINION! VALORO MUCHISIMO VUESTRAS PALABRAS Y CRITICAS CONSTRUCTIVAS. ¡CAPITULO 5 PUBLICADO NARCISOS ! ¡Publico nuevos capítulos de mi novela TODOS LOS DÍAS! he estado últimamente algo desmotivada PERO ESO SE ACABÓ ^^ YA TENÉIS NUEVO POEMA, "DESDE LO MÁS ALTO DE LA MÁS ALTA TORRE." espero que os guste mis queridos narcisos. NUEVO POEMA NARCISOS !!!! "COMO ÉL... ¿AMA?" ¿Preparados? Espero que os guste ! Si el universo fuese poema se llamaría Cosmos. Espero que os guste Narcisos ! NUEVO POEMA CADA MIÉRCOLES, ¡DEJAD VUESTRAS OPINIONES EN LOS COMENTARIOS! ¡Y DAD A ME GUSTA SI LO HABÉIS DISFRUTADO! ^^ GRACIAS, MIS NARCISOS. Laura AshHeart published a new chapter 'CAPITULO 10' from the story 'MACABRA POESÍA'. Laura AshHeart published a new chapter 'CAPITULO 9' from the story 'MACABRA POESÍA'. Laura AshHeart published a new chapter 'TODOS LOS NIÑOS CRECEN, EXCEPTO UNO' from the story 'VERSOS DESVELADOS'. Laura AshHeart published a new chapter 'CAPITULO 8' from the story 'MACABRA POESÍA'. Laura AshHeart published a new chapter 'CAPITULO 7' from the story 'MACABRA POESÍA'. Laura AshHeart published a new chapter 'CAPITULO 6' from the story 'MACABRA POESÍA'. Laura AshHeart published a new chapter 'CAPITULO 5' from the story 'MACABRA POESÍA'. Laura AshHeart published a new chapter 'CAPITULO 4' from the story 'MACABRA POESÍA'. Laura AshHeart published a new chapter 'CAPITULO 3' from the story 'MACABRA POESÍA'. Laura AshHeart published a new chapter 'CAPITULO 2 ' from the story 'MACABRA POESÍA'. Laura AshHeart published a new chapter 'CAPITULO 1' from the story 'MACABRA POESÍA'. Laura AshHeart published a new chapter 'CAPÍTULO 1' from the story 'MACABRA POESÍA'. Laura AshHeart published a new chapter 'DESDE LO MÁS ALTO DE LA MÁS ALTA TORRE' from the story 'VERSOS DESVELADOS'. Laura AshHeart published a new chapter 'PROLOGO' from the story 'MACABRA POESÍA'. MACABRA POESÍA's cover picture was updated. Laura AshHeart published a new chapter 'COMO ÉL... ¿AMA?' from the story 'VERSOS DESVELADOS'. Laura AshHeart published a new chapter 'ALLÍ ESPERO' from the story 'VERSOS DESVELADOS'. Laura AshHeart wrote a comment on 'VERSOS DESVELADOS' in the chapter '¡GLORIOSA CAÍDA! '.